Here we are again, in full apple season. 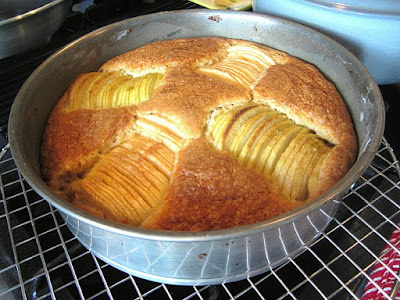 As you know my favorite cake is an apple cake. How many apple cakes must I bake until I find the perfect one? I will continue my quest for the BEST apple cake.....(truthfully, they are all good, or I wouldn't post them). Here, it's not only about the taste of this cake being so good, but the presentation! Preheat the oven to 350°F. Grease a 9-inch springform pan with butter, then line the bottom of the pan with a round of parchment paper and grease the paper as well. Place the apple halves, cut side down, on a cutting board. Use a knife to cut halfway through the apple halves in thin parallel slices, so that they stay intact. This is hasselbacking, I have done this with potatoes, squash, you name it. In a bowl, toss the apples with the lemon juice and the 2 tsp light brown sugar and set aside. Beat together the butter and granulated sugar in a bowl with an electric mixer until fluffy, about 5 minutes. Add the 2 tablespoons of honey and beat until combined. Add the vanilla and egg yolks, beating until just combined. Sift together the flour, baking powder, and kosher salt in a small bowl. Fold the flour mixture into the butter-sugar mixture until just combined. In another bowl with clean beaters, beat the egg whites until stiff peaks form, about 5 minutes. With a rubber spatula, stir half of the egg whites into the batter, then gently fold in the remaining egg whites until just combined. *(Is it really necessary to separate the egg whites from the yolks....I say nay for this cake, but it will yield a lighter fluffier cake....so you make the decision, I am usually too lazy!). Pour the batter into the prepared cake pan, smoothing the top. Arrange the apple halves, flat side down, onto the cake batter, pressing them down slightly. Pour the accumulated apple juices onto the cake. Bake until a toothpick or cake tester inserted into the center of the cake comes out clean, 35 to 40 minutes. Let cool on a rack for 5 minutes, then slide a knife around the edge of the cake and remove the sides of the springform pan. When ready to serve, make a glaze in a small pot by warming the remaining 1/4 cup honey with the orange juice and whisking together until thin (you can do this in the microwave for 20 seconds). Brush the honey mixture all over the cake. 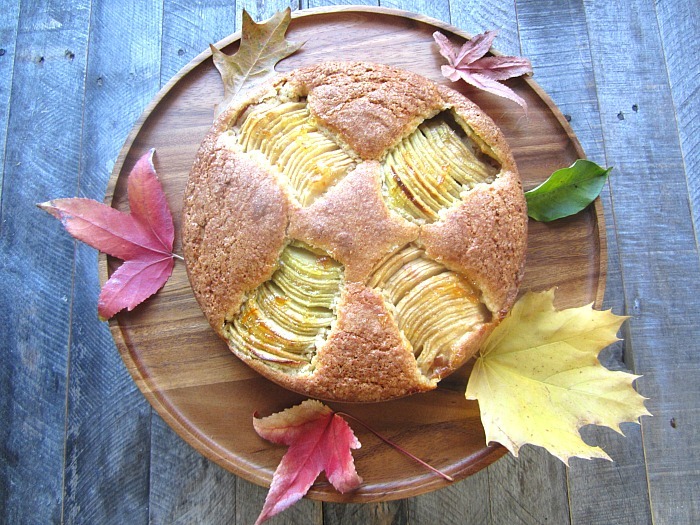 This is one pretty fantastic apple cake! I read about a trick, from America’s Test Kitchen (I think), where you place a skewer or small chop stick on each side of what you are slicing to prevent you from slicing all the way through the item. I think ATK was making hassle back potatoes but why not do the same with apples?